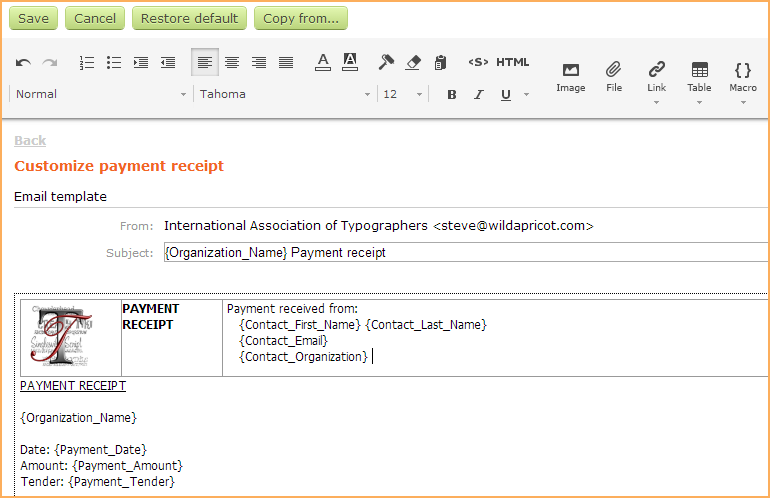 Separate templates are used as the basis for payment receipts and donation receipts. You can customize the content and appearance of receipts on an individual basis before emailing them, or modify their templates to customize all subsequent invoices or receipts. customize the payment receipt template. If you want the payer to be automatically emailed a payment receipt, check the Send receipt to payer option. If you want to email a copy of the receipt to everyone specified under your email routing settings, then check the Copy receipt to organization contact option. Payment receipts are not automatically emailed when a manually payment is recorded. Administrator can, however, manually email the receipt. To modify the template used as the basis for payment receipts, click the View/edit receipt template link within your payment receipt settings. You can then click the Send test email button to receive a sample receipt email or click the Edit button to begin customizing the template. When you click the Edit button, the content editor toolbar appears at the top of the screen. Using the content editor, you can customize the template by adding or removing text, graphics, and macros. Since the same receipt template is used for all transactions – other than donations – you should not include information specific to any particular kind of transaction. For example, you should avoid including event details or information about individual membership levels. You can insert macros to include variable information such as contact name. You cannot edit or otherwise modify macros. You can only insert or remove them. To insert a macro, click within the template where you want the information to appear, then click the Macro icon within the toolbar. From the list that appears, select the macro you want to use then click the Insert macro button. 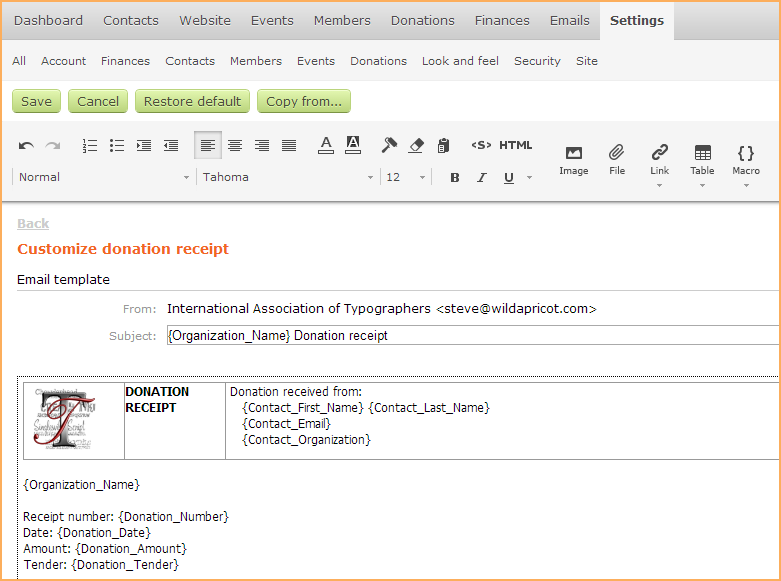 customize the donation receipt email template. 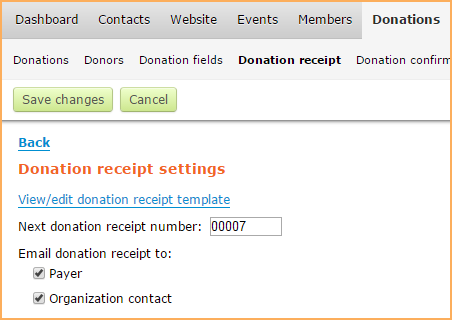 The donation receipt number is automatically incremented each time a new donation receipt is created. You can set the next receipt number to be used, but if you enter a number that is already in use, multiple donations may end up with the same receipt number. The receipt number can up to 7 digits in length. If you want the donor to be automatically emailed a donation receipt, check the Payer box. If you want to email a copy of the receipt to everyone specified under your email routing settings, then check the Organization contact box. To modify the template used as the basis for donation receipts, click the View/edit donation receipt template link within your donation receipt settings. You can then click the Send test email button to receive a sample receipt email or click the Edit button to begin customizing the template.